Last night we anchored at Pedder Bay, on first anchorage in Canada on our way to Juneau, Alaska. A rather boring anchorage, home to Canadian Forces base and a marina up the river. After some grilled Shish Kabobs and a game of Mexican train with our "virgin player" Jörgen we turned in early. Lars started the engine at 05:32 and set course to our next destination: Broken Group, Pacific National Park. A group of islands that has become the favorite destination for boaters and kayakers. 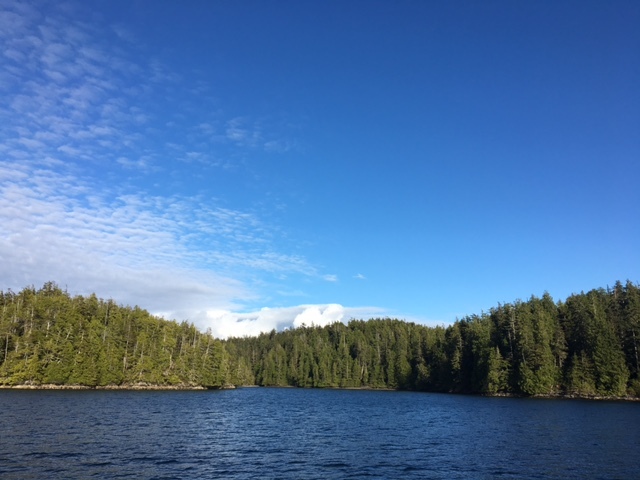 A multitude of low-lying islands and islets (more than one hundred) you feel in the Canadian wilderness. We will settle at Effingham bay for the night and proceed to the town of Tofino. Had we arrived here early enough we would have set the dinghy in the water and explore the island and Meares Bluff, with hang cliffs as high as 100m. Got in too late. Time for a nice barbecue. But due to a mishap a Bald Eagle took the barbecue's gas valve and dropped it in the sea.